The MAX4464 MAX4470 MAX4471 MAX4472 MAX4474 family of micropower op amps operate from a single +1.8V to +5.5V supply and draw only 750nA of supply current. The MAX4470 family feature ground-sensing inputs and Rail-to-Rail output. The ultra-low supply current, low-operating voltage, and Rail-to-Rail output capabilities make these Operational Amplifiers ideal for use in single lithium ion (Li+), or two-cell NiCd or alkaline battery systems. 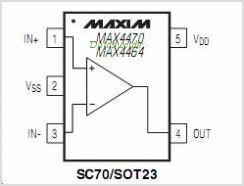 The Rail-to-Rail output stage of the MAX4464 MAX4470 MAX4471 MAX4472 MAX4474 Amplifiers is capable of driving the output voltage to within 4mV of the rail with a 100k load, and CAN sink and source 11mA with a +5V supply. These Amplifiers are available in both fully compensated and decompensated versions. The single MAX4470 dual MAX4471 and the quad MAX4472 are unity-gain stable. The single MAX4464 and the dual MAX4474 are stable for closed-loop gain configurations of e +5V/V. These Amplifiers are available in space-saving SC70, SOT23, MAX, and TSSOP packages. This is one package pinout of MAX4470,If you need more pinouts please download MAX4470's pdf datasheet. MAX4470 circuits will be updated soon..., now you can download the pdf datasheet to check the circuits!